A Paper Garden: Whoo Hooo - Party time! Whoo Hooo - Party time! Its my turn to issue a justjohanna Earth Day Extravaganza challenge! So my challenge to you is to use something from nature when making your card. Maybe its a twig, dried flower, leaf, shell or a feather that you incorporate into the design. Or maybe you use a leaf rubbing for a background, or use a leaf or flower as a mask. Heck - you can even put a seed packet in a pocket card. When you finish your card - add a comment with a link to it (I wanna see!). The deadline is midnight California time on 4/20. I will randomly draw one name to win the limited edition Earth Day stamp from justjohanna. I will draw a second name to win a Denim and Lace papercraft kit from the Paper Garden Projects store. Then all the names will be sent to Johanna so she can draw the grand, second and third prize winners. 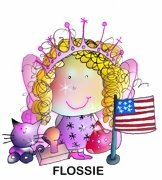 You may win $250 in stamps - Whoo Hoo!! Here are my two samples. The first one uses a trio of justjohanna owls (Michou, Alma big and Madricaine) on a twig. The sentiment is justjohanna also. The paper is Prism, Bazzill and We are Memory Keepers (from my stash). Its colored with Copics. For my second sample - I added a fancy tail to Auntie Stu with feathers. The trim is made with the Lacy Days of Summer Punch. The paper is My Minds Eye (from my stash). So lets see your creations! 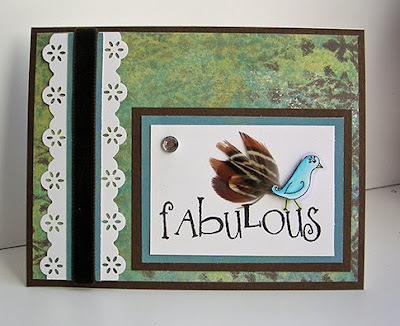 Great theme for a challenge, and fabulous cards! Awesome challenge. I do love those feathers! these are cute and very natural! This is a awesome idea! TKS!! Thank you for your wonderful theme and sample. Here's another one even if it does not count. I did try to do your challenge, but I just don't have anything decent in my yard. The snow just melted, there's no twigs, so I'll find something at the park this week and do a card up. Thanks for the fun challenge Catherine! 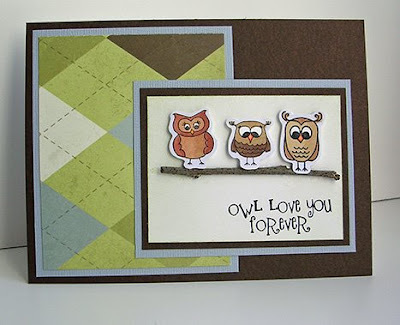 Here is a link to my card (yes, its an owl - sigh) LOL!